Welcome to Kling Courtyard Apartments. We have an optimized screen reader version of this site available. Welcome to Kling Courtyard, where stylish living meets elegance! Surrounded by famous landmarks and all the fun Southern California has to offer, Kling Courtyard is conveniently located near major commuter freeways I-5, 170, 134 and 101 as well as to all major studios (Universal, Disney, Warner Brothers). Spend an afternoon or evening in the NoHo Arts District. Walking distance to wonderful restaurants, live theater and exciting entertainment venues and biking distance to the North Hollywood Red Line subway station, Kling Courtyard provides everything you need for an active lifestyle! Kling Courtyard is more than a place to live, it is a home where there is a real resident community. 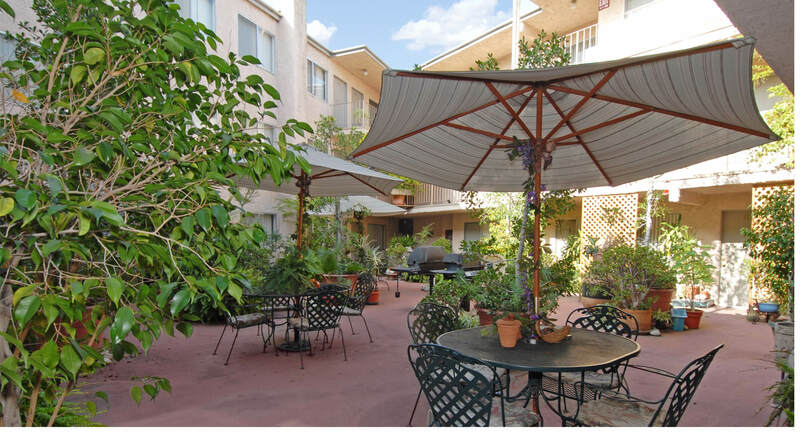 Many of our residents work in the entertainment industry and can be seen socializing in our landscaped courtyard with patio tables with umbrellas, seating and barbecue areas. Our floor plans are both functional and flexible, offering an impressive array of features. Stylish comforts include plush wall-to-wall carpeting, expansive living areas, walk-in closets and more. Don't settle for less, when you can have the best at Kling Courtyard. Not only do we offer unmatched features in our apartment homes, we also provide an impressive range of community amenities. With the convenience of a laundry facility, gated entry, parking, and a professional management team, our pet friendly community will meet all of your living needs. Please visit our photo gallery and see for yourself why Kling Courtyard is the perfect place to call home!